The waters of the Shashe River join those of the Limpopo close to where the borders of South Africa, Botswana, and Zimbabwe converge. Nearby, on the right bank (on South African territory) sits the Greefswald farm. It is the property of the Republic of South Africa, and its “cultural landscape” has been inscribed on UNESCO’s World Heritage List. As for the natural landscape, it is high savanna, home to the thorn tree and mopane, covered with grass in the rainy season and dotted here and there with enormous baobab trees. Mapungubwe, the “hill of the jackals” in Venda (a language of southern Africa), is a steep–sided sandstone outcrop that gives its name to a collection of archaeological sites in the vicinity dating from the tenth to the thirteenth century. During apartheid, this site was one of the battlefields over the country’s past (the skirmishes were fought among white academics, it goes without saying): was it possible, the whites asked, that black Bantus were responsible for Mapungubwe, or was it necessary to invoke some other population with a more noble pedigree? Was it possible that the Africans who had lived and prospered here were the ancestors of the black South Africans then confined to Bantustans, or “reserves,” and townships? Was it possible that civilized natives had preceded white colonists on ground where the latter believed, or gave the impression of believing, that they were the first occupants? As befits a place that is today considered the “capital” of the first South African kingdom, the objects discovered there have become the country’s “crown jewels,” and the history of their transmission to our own time, an archive. From the moment of its discovery, a story developed that gave prominence to white heroes—as could only be expected of a site for which the colonial elite was both the discoverer and the exegete—just as elsewhere colonial settlers and Western readers were fond of a white queen of the Atlanteans. As is often the case when lieux de mémoire are at stake, this intrigue transformed a banal story of pillage into an allegory that romanticizes the circumstances of the objects’ discovery. It is therefore a story of mystery and friendship, which perhaps really happened in the way it’s been told, but is no less mythical for it. In his youth, Francois Bernhard Lotrie had served as guide to missionary and explorer David Livingstone; he had been a gold prospector and elephant hunter. At the beginning of the twentieth century (he died in 1917), Lotrie settled in the Soutpansberg massif not far from Limpopo. Here, we are told, the eccentric, solitary old man gave an African friend, Mowena, an ancient piece of terra-cotta pottery. It was said that he had taken treasures from a sacred hill he had discovered. Around 1930, a group of young men went for a weekend hunt in this same region. Of course, they were whites, for only whites could freely cross the property of other whites. While looking for water, they came across an old man, an African, who diligently and respectfully offered them refreshment. The old man was Mowena. One of his young guests, Jerry Van Graan, a student of history at Pretoria, was intrigued by the vessel to which he put his lips: the celebrated terra-cotta. Returning in December 1932 with a group of his friends, he managed to identify and climb the hill on the Greefswald farm. There they discovered tombs, and they spent days disturbing them, laying hands on a small rhinoceros made of gold foil. Completed much later from scattered data, the retrospective inventory of three disturbed tombs (out of around thirty) reveals that they were shallow graves, perhaps surmounted by stone slabs, where the dead were buried in a sitting position, unless the skeletal remains had initially been buried elsewhere before being reburied there. The graves contained several golden animals, the gold casing of a “scepter” or a cane as well as a headrest, gold filigree jewelry, thousands of gold beads, tens of thousands of glass beads, and both intact and broken pottery. Seized with misgivings, the young man would later write to Leo Fouché, his former history professor, to inform him of his discovery. Fouché, a liberal Afrikaner, immediately had the farm bought by the state, purchased objects coming from the site that had not already been dispersed or melted down, and launched the first excavation campaign. It was learned that other clandestine visitors had climbed the hill during the 1920s. Since then numerous structures have been excavated, a remarkable series of objects have been discovered, but of course information we would like to have about the disturbed graves themselves is lost forever. The golden rhinoceros is nothing more than a recovered stolen document, except that a stolen archaeological artifact will always remain lost—even if it is rediscovered: it will always be missing the associations its original context would have allowed us to observe. The archaeological research carried out over several decades at Greefswald has revealed stratigraphic deposits several meters thick, not only at the top of the hill but also at its base, as well as at several other sites within a radius of a few dozen kilometers from the hill. The sequence of occupation illustrates an increase in population size and social differentiation between the tenth and the thirteenth century. Social differentiation is especially noticeable toward the summit of Mapungubwe, an area occupied by a new elite from the end of the twelfth century, and toward the upper end of the stratigraphic deposit, corresponding to the last occupations a little before 1300, when high-ranking individuals had themselves buried there with their wealth, thereby denying it to the living. But can we refer to them as kings without presupposing the nature of a political formation we can apprehend only very imperfectly through the prism of archaeology? Let’s stick with kings, if the golden objects are to be taken as royal symbols or evidence of royal status, but only if we don’t forget the other dimensions of the society the archaeological data shed light on. Here medieval societies were distinctly pastoral. At the excavated sites, domestic spaces were spread out around a vast central corral, a sign of the important place cattle occupied not only in the economy and diet, but also, more generally, in all social transactions, notably matrimonial ones, as was the case in the societies of southern Africa in later centuries. The numerous clay animal figurines, particularly of cows, that come from this region further reinforce this point. To better grasp Mapungubwe’s significance, we must zoom out to measure the regional synchronies while also honing in on the elements of material culture. That the rise of the sites on the right bank of the Limpopo is linked in one way or another to the development of mining on the plateau on the other bank, in current-day Zimbabwe, is very probable, partly because, as far as we know, gold was not exploited on the South African side until the colonial era. That strong social distinctions and spectacular evidence of the accumulation of gold begin to appear in this fluvial region at exactly the same time as the oldest mentions of a gold trade with the south coast of East Africa is equally remarkable. A triangular relationship thus took shape about which we can be even more precise. The minute glass beads, found in the thousands during the excavation, likely originated in Arikamedu, near Pondicherry, in southeast India, unless they came from another atelier in the “Indo-Pacific” production zone. Like the cowries from the Maldives, or the fragments of Song dynasty greenware, “celadon,” these beads bear witness to the trade nourished by the commercial zone of the Indian Ocean. In exchange, did the little “kingdom” of Mapungubwe export elephant ivory (we have found bracelets whose standardized form and technique suggest serial production); the skins of cats and other carnivores, if we are to judge by the bones of genets, civets, leopards, servals, and lions that show signs of cut marks, and which have nothing to do with food waste; and gold? Perhaps, although only gold objects (beads, jewelry, objects finished with gold leaf) have been uncovered, not ingots, which would soon have been melted down. But it’s not necessary: Magpungubwe Hill could have traded in several directions with its new regional partners without necessarily being their intermediary. It could have profited from this trade by amassing a treasure out of goods that the other regional partners bought or sold for their weight value. Symbolically, a golden rhinoceros was something more than a gold nugget or a dinar. The little rhinoceros is perhaps, in its way, evidence of the existence of a network of contacts even more complex. Reassembled, then restored, the object measures a little more than fifteen centimeters long. It is solid in appearance; the neck looks more “robust” than that of the real animal. But its compact appearance, the projection of its shoulder line, and its lowered head reinforce the feeling of power that emanates from the figurine. Lines of small, regular perforations indicate that the hammered foil was riveted to a wooden core, which is corroborated by the gold pins found during the sieving of the sediment from the graves. The animal’s tail is a thin, solid gold cylinder, the ears delicately cut out-turned ovals, the eyes two small half-globular “upholstery nails,” the horn a gold foil cone. The horn? It has long been pointed out that unlike the African rhinoceros, which has two horns, the golden rhinoceros of Mapungubwe has only one. Its excavators, custodians, and restorers were categorical on this point: it had never had a second horn. We can see here a simple stylistic feature or the representation of an Asian species, the Indian rhinoceros (Rhinoceros unicornis) or the Javan rhinoceros (Rhinoceros sondaicus), both of which have a single horn. For this reason, some scholars have considered the rhinoceros, emblematic of the site and the history of South Africa as a whole, an imported object. That is unlikely for its golden carapace; studies done on the geochemical fingerprint of the metal from several gold objects found at Mapungubwe point to a regional provenance. But it re- mains a possibility for the object’s missing part: its core, certainly made of wood, which began to slowly disintegrate as soon as it was buried. Only a meticulous excavation could have yielded fibers whose analysis might have revealed its species and age. We will thus stick with the hypothesis that the wooden figurine was perhaps made elsewhere than Africa, and was gilded on the banks of the Limpopo as a sign of its appropriation by royalty. At any rate, this hypothesis is not even necessary if one simply wants to illustrate the emergence of a power capable of harnessing the political benefits of a commercial relationship with unknown worlds. For Mapungubwe, with its society based on a traditional agricultural economy, was situated both beyond the horizon of regular Islamic trade—probably even beyond the limits of the land known to the coastal African merchants—and at a good distance from the goldfields of the Zimbabwean plateau. Th Order of Mapungubwe, established in 2002, is the highest distinction awarded by the Republic of South Africa; its insignia incorporates the golden rhinoceros. The account of the site’s discovery is taken from Sian Tiley, Mapungubwe: South Africa’s Crown Jewels (Cape- town: Sunbird Publishing, 2004), which catalogs the objects kept in the museum dedicated to Mapungubwe at the University of Pretoria. The original excavations by Leo Fouché were published in Mapungubwe, Ancient Bantu Civilization on the Limpopo (Cambridge: Cam- bridge University Press, 1937). The Mapungubwe Cultural Landscape was added to the list of World Heritage sites in 2003. For a presentation of the site as a “cultural landscape,” see Jane Carruthers, “Mapungubwe: An Historical and Contemporary Analysis of a World Heritage Cultural Landscape,” Koedoe 49 (2006): 1–13. Andrie Meyer, “K2 and Mapungubwe,” South African Archaeological Society Goodwin Series 8 (2000): 4–13, delivers an excellent synthesis of the stratigraphic sequence. For a retrospective inventory of the tombs’ contents and an updating of the anthropological data based on unpublished photographs, see Maryna Steyn, “The Mapungubwe Gold Graves Revisited,” South African Archaeological Bulletin 186 (2007): 140–146. Some samples of gold from Mapungubwe have undergone a spectrometric analysis; see B. Grigorova, W. Smith, K. Stülpner, J. A. Tumilty, and D. Miller, “Fingerprinting of Gold Artefacts from Mapungubwe, Bosutswe and Thulamela,” Gold Bulletin 31 (1998): 99–102. Linda C. Prinsloo, Nigel Wood, Maggi Loubser, Sabine M. C. Verryn, and Sian Tiley, “Re-dating of Chinese Celadon Shards Excavated on Mapungubwe Hill, a 13th Century Iron Age Site in South Africa, Using Raman Spectroscopy, XRF and XRD,” Journal of Raman Spectroscopy 36 (2005): 806–816, off s a new dating of Chinese greenware fragments that enables us to determine when the site’s sequence of occupation ended. Finally, a study of glass beads has recently been done by Marilee Wood, “Making Connections: Relationships between International Trade and Glass Beads from the Shashe-Limpopo Area,” South African Archaeological Society Goodwin Series 8 (2000): 78–90, from which is borrowed the hypothesis of an Indo-Pacific origin. The animal data come from Elizabeth A. Voigt, Mapungubwe: An Archaeozoological Interpretation of an Iron Age Community (Pretoria: Transvaal Museum, 1983). Two new gold foil figurines— one a humpbacked bovine, the other a cat—were reassembled from fragments in 2009 and are on display in the Mapungubwe Museum in Pretoria. For a vigorous perspective on the various historical interpretations of Mapungubwe, see Munyaradzi Manyanga, Innocent Pikirayi, and Shadreck Chirikure, “Conceptualizing the Urban Mind in Pre-European Southern Africa: Re- thinking Mapungubwe and Great Zimbabwe,” in P.J.J. Sinclair, G. Nordquist, F. Herschend, and C. Isendahl (eds. ), The Urban Mind. Cultural and Environmental Dynamics (Uppsala: Uppsala University, 2010), pp. 573–590. Th University of Pretoria has published a compendium of numerous documents relating to the history and institutional environment of the excavations at Mapungubwe: S. Tiley-Nel (ed. ), Mapungubwe Remembered: Contributions to Mapungubwe by the University of Pretoria (Pretoria, 2011). Among the reproductions of important documents are Van Graan’s letter to Fouché and the transcript of an interview in which the aged Van Graan recounted the circumstances of the discovery. From THE GOLDEN RHINOCEROS: Histories of the African Middle Ages by François – Xavier Fauvelle, Translated by Troy Tice, Illustrated by Roland Sárkány. Originally titled le rhinocéros d’or. Original French edition © Alma éditeur, Paris, 2013. Copyright © 2018 by Princeton University Press. Reprinted by permission. 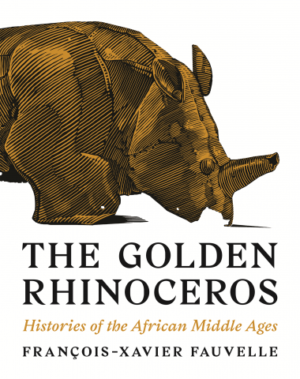 To read more stories like this one, readers can purchase The Golden Rhinoceros by Francois-Xavier Fauvelle from the Princeton University Press.